On February 27, 2012, we were honored to have Wayne Elementary students in grades Kindergarten through Second make Valentines Day cards for our soldiers in Afghanistan. There were thirteen classes consisting of 260 students who made these special cards for our soldiers. We hope the Valentines helped to ease the pain of soldiers being away from their family on Valentine's Day. Thanks students! The following picture and article was featured in the Wayne County News (http://www.waynecountynews.com/news.html). WAYNE – One local funeral home is trying to spread love to the men and women in the armed services as Valentine’s Day approaches. 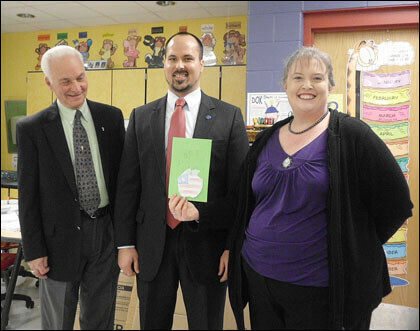 Johnson Tiller Funeral Home has launched “Operation Valentine” by dropping off supplies for the kindergarten, first and second grade students at Wayne Elementary School for them to make Valentine’s Day cards. On Friday, Dewey Johnson, Chad Tiller and Selena Draper stopped by the school to pick them up so the cards can reach the military personnel by Feb. 14.